[Part 1] For the last several days, I have struggled to get SMSLib for Java up and running. I finally realized that my copy of RxTx was out of date, which explained my inability to establish a bluetooth serial connection with my phone. I grabbed the new universal RxTx library and now it is working. 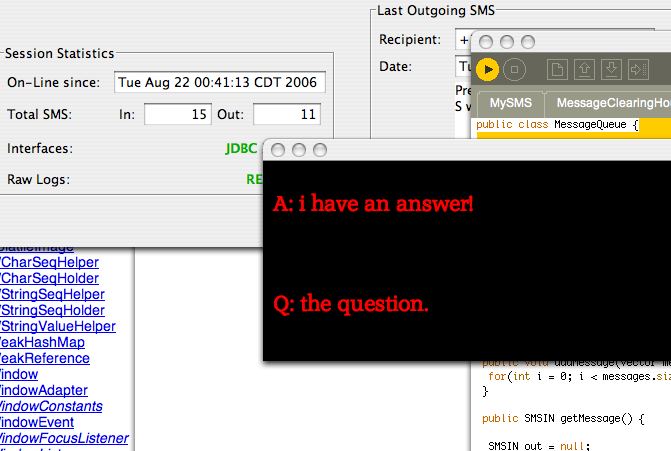 Unfortunately, the SMSServer example that comes with SMSLib did not play nicely with MySql out of the box. The documentation was a bit outdated and I had to do some serious database interface hacking/redsign to get it running. But, I finally got the whole system running. My phone is communicating with SMSLib, which communocates with a MySql database, which is easily accessible in Processing (or Max/MSP/Jitter or any other software for that matter). The system allows addresable message routing and is sophisticated enough to flash message instructions back to participants in need of help. Now that all the hardware and basic framework is coded and running smoothly, I have to finish coding the “pretty” side of things, which has been in the works for quite some time. Hopefully this will all be working nicely for the Freshworks Show coming up in a couple weeks. As a side note, we are planning to use this technology, along with others as the primary interface for our ArtsMosis 2006 project. This entry was posted on Tuesday, August 22nd, 2006 at 1:55 am and is filed under ArtsMosis 2006, Progress, Thoughts, Urban Echo. You can follow any responses to this entry through the RSS 2.0 feed. You can leave a response, or trackback from your own site.